Save $20 with this Black Friday rebate through 12/02/18. Limit $100 of savings (5 BLACK PACK products) per address. 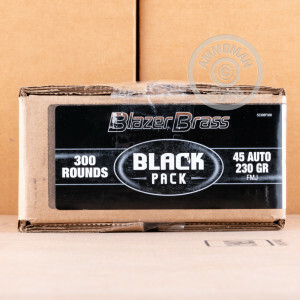 The Black pack by Blazer Brass is for serious shooting enthusiasts -- the ones who know that a single box of cartridges is never going to hold them over at the range. 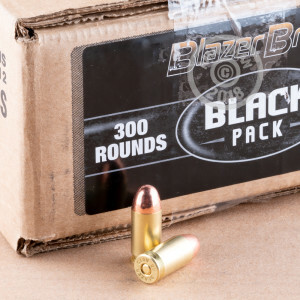 This beefy container is filled with 300 rounds, just what you need for a lengthy session of target shooting or just to sit on for a rainy day. And remember, if you buy practically anything else on our site at the same time as you do this hefty package, the shipping and handling is on us! This 45 ACP round features a brass casing, unlike Blazer’s typical aluminum fare, so it’s perfect for handloading and for use at ranges with rules against aluminum. The round’s 230 grain bullet features a full metal jacket, so you can enjoy more accurate shots until bore fouling necessitates a proper cleaning. This is a very standard 45 ACP cartridge between its bullet weight and its 830 fps muzzle velocity, so training with it will familiarize you well with your pistol’s performance in the field.